Christians meet with Sunni Islam’s top leader, test other responses to extremists. Fawzi Khalil recalls what he saw on a recent visit to Dohuk, Iraq. Refugees slept on streets and under bridges, fleeing the wrath of ISIS. Khalil is the director of relief ministries at Kasr el-Dobara, the largest Protestant church in the Middle East. Since the fall of Mosul and the eviction of its historic Christian community, the Egyptian megachurch has distributed over 2,500 mattresses to both Iraqi Muslims and Christians. More than $300,000 has been raised—primarily from Egyptian Christians—to provide 2,200 families with medicine, a portable stove, and an emergency food package. The church sends a delegation to Iraq every two weeks. 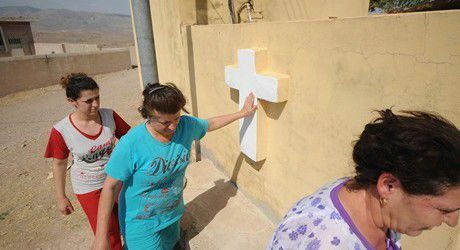 But the savagery of ISIS, which has overwhelmed Kurdistan with more than 850,000 refugees, has prompted other Middle Eastern Christians to embrace their Muslim neighbors. This theme was heard often from members of the Fellowship of Middle Eastern Evangelical Churches (FMEEC), who met in Cairo last month for a conference on the dwindling Christian presence in the region. Others were more reflective of the diversity among both Muslims and non-Muslims.